The following is a review of Just For Him's Shortcut To Mushroom in the Middle Earth Pipeweed Series. I did this review on 2/19/06. 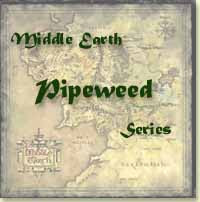 This is the fourth blend in the Middle Earth Pipeweed Series! Rich, dark Latakia is blended with mushrooms straight from Farmer Maggot's field to produce a truly unique smooth, creamy, earthy smoke with a hint of sweetness. I keep gobbling this stuff up! I have placed an additional two orders since review...and ordered some for a "box pass" I'm involved in. Yummy yummy stuff! Shortcut To Mushroom another blend from Just For Him and my favorite from the Middle Earth Pipeweed line. I enjoy Latakia most so this one fits my bill just fine. Special thanks to the blenders in dar Shire. Others have compared it to Frog Morton On The Town, one of my favorites, and thats a good comparison. As far as it tasting like mushrooms...I can't tell and I hate mushrooms. This blend just has a smoky/earthy feel and taste to it and burns cool. Sometimes this blend can give me a nice nicotine fog, eyelids a little droopy - nice and not overdone. So if you like thee ole Lata and want to smoke something with a gimiki name then fire some of this up!